Brief Description of Subject: Gothic arched window with two lancets, each with an eight-pointed medallion above and below, and a round medallion above all. Right window shows Ascension of Our Lord. Six Apostles are shown standing or kneeling around Him. Medallion above shows a winged lion [symbol of St. Mark]. Medallion below features eagle [St. John the Evangelist]. 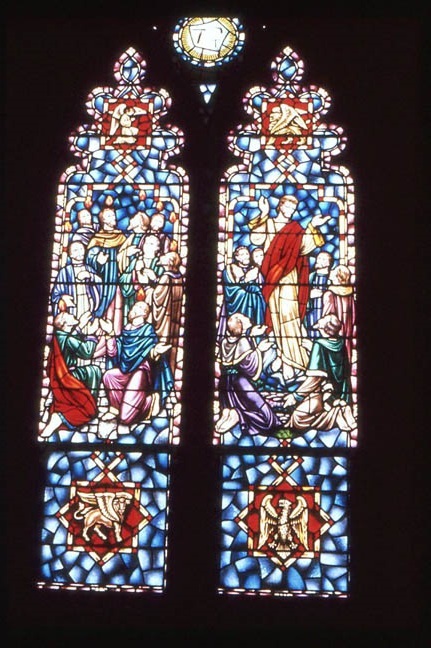 Left window shows Pentecost. Nine Apostles stand or kneel with tongues of fire above their heads. Medallion above depicts a winged man [St. Matthew]. Bottom medallion shows a winged ox [St. Luke]. Medallion at top of window shows carpenter's tools and the Hebrew letters for Yahweh, the name of God. Window made by J. Wipple and Co., of London, England. All church windows installed by Bela Britok, of Detroit, MI.